The Green Mountain Horse Association (GMHA) has been around since 1926. If you said this about a trucking business, your mind might travel back over the years and wonder what the trucks looked like back then. Trucks, like everything in the modern world, have picked up the pace to race around the clock. Everything moves at full gallop on a 24/7 schedule. Horses, though, have evolved over 50 million years and change comes more slowly in nature. Somehow I find it comforting to watch a horse extend its head and nip a bunch of grass beside a brook and take time to savor the taste. I grew up on a small ranch outside of Tucson, Arizona where we raised Quarter Horses and much of our own food. My experiences on the ranch and in 4H Club (my brothers and I were members for years) instilled in me an appreciation for the rhythm of living things moving mindful only of the moment. GMHA offers us an opportunity to change our pace to the particular rhythms that surround horses. Located on Route 106, past the South Woodstock store, GMHA is an integral part of the Woodstock community. In fact, the Tuck School of Business recently completed a study on the impact GMHA has had on its local economy, and found that they had injected a whopping $4.2 million per annum through direct impacts (visitors eating and shopping locally) as well as indirect impacts (the contractors brought in for upkeep of the property). The true impact, or the one that matters most to me, is the chance GMHA gives to local children and families and those from nearby states and countries (well, really just one country—Canada) visit GMHA to experience working hands-on with horses. Vermonters might take country life for granted, but those from more crowded places may not have the resources to board and raise their own horses (it should be noted that GMHA does not have horses, so children bring their own). In addition to teaching children riding skills, GMHA shows them how to care for a horse. They learn basic grooming, nutrition, and veterinary care through programs like the Junior Horsemanship Clinic. 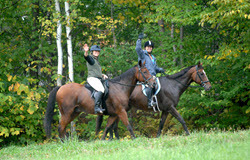 Horses are an expensive hobby, so GMHA provides a variety of scholarships for qualifying riders. GMHA is a great place to stop or plan an afternoon of fun for the family. There is no entrance fee to watch the shows, so you can hang out for the day and watch the horses and riders go through their paces. You’ll be able to share in a moment or two petting the horses or talking to the riders while they are at rest. You can bring a brown bag snack, but GMHA has a sweet little café, which is open for events. GMHA has something going on at all times of year, even winter, since horse lovers passions don’t wax and wane with the weather. GMHA has many events planned, so you’ll want to check out their schedule. From my perspective, the must-see events are the Team Jumper Challenge and Lobster Bake in July (no the lobster isn’t local) and Chef’s Night (yes, they are local), and sample sumptuous fare. GMHA’s Mission: GMHA is dedicated to providing and maintaining opportunities for educational and competitive activities for diverse equestrian disciplines; emphasis is placed on equestrian trails preservation, horsemanship and youth education.